Birthplace: Elizabeth City Co. (Hampton), Va.
George Wythe was one of the very most distinguished men of his age, yet due to his modesty and quiet dignity, we learn little about him from the history books. He was born in Elizabeth County Virginia, in 1726, of a wealthy agricultural family. His father died when George was three, but his mother, who was extraordinarily well educated for a woman of that day, tutored him in the classics in a manner that would take him far indeed. His mother died when he was still a teenager and his oldest brother, who took no interest in George, inherited the family property. George entered the college of William and Mary but was unable to keep up with the fees. He dropped out and then managed to secure a study of law at the office of a Stephen Dewey. His studies were so successful that he was admitted to the bar in Spottsylvania County in 1746, at the age of 20. Everyone who came into contact with him was impressed. He was appointed clerk to the Committee which formed the rules of conduct and elections in the House of Burgesses in 1746. In 1753 the Royal Governor of Virginia made him Attorney General, to fill the shoes of Peyton Randolph while he traveled to England. In 1755 Wythe was elected to represent Williamsburg at the House of Burgesses. At that time, his oldest brother died, and he inherited the family farm. Wythe served in the House of Burgesses until it was dissolved, on the eve of the revolution. His most valuable contribution to the new nation was his involvement in education. This began in 1761 when he was elected to the Board of Visitors at the College of William and Mary. Eight years later the man who could never gain a degree for want of the money to do it with, became America's first Professor of Law. His students included Thomas Jefferson, Henry Clay, James Monroe, John Marshal, and several dozen other distinguished public servants. He taught for twenty years and admitted to no greater love than that of forming young minds. In 1775 Wythe was elected to attend the Continental Congress. He served for two years, voted in favor of the Resolution, and for the Declaration. In 1776 he was called back to Virginia in order to help form the new government. He was elected Speaker of the Virginia House of Delegates in 1777. The following year he was made one of the three Chancellors of the State of Virginia, a post that he served in for the rest of his life. 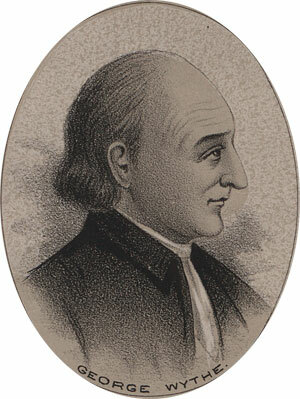 George Wythe was revered as a man on great honor and integrity. He was a republican in all things, and a quiet abolitionist. He freed his slaves and made provisions for their support until they could earn a living for themselves. This ended in tragedy-and that tragedy would cost Wythe his own life. A young member of his family, on discovering that Wythe had conditionally willed part of the family property to his slaves, decided to enlarge his own share by poisoning them with arsenic. He incidentally murdered George Wythe in the process. Wythe died on June 8, 1806 at the age of 80.